Pattern Cut Design Z Discounts Apply ! Pattern Cut decorative wood return grilles are a great addition to any room. These decorative wood return grilles can be painted to match your walls or stained to match your trim. They come in 26 different designs ensuring you'll find the perfect grille for any home. These return grilles are cut from 1/4" thick Baltic Birch. The face of the grille is a furniture grade veneer of either Oak, Maple, or Cherry. These grilles are shipped to you sanded and ready to be finished. Due to the many customizable features of these decorative wood grilles, they must be cut to order. Please allow five business days before your grille ships. If you do not see the size or shape you need listed on our website, call us at 800-504-5989 for a custom quote. Also available is an Adjustable Damper which is sold separately. This damper is available in 21 sizes and allows your to control the air flow with the turn of a screwdriver. To install, simply place the damper into your duct before installing your decorative wood grille over it. The decorative wood return grilles are meant for the wall and ceiling only. They are not intended to be used in the floor. - Measure the size of your duct opening in inches Width x Length. - In the first drop down menu titled "Size/Price" select the corresponding size. Hint: The faceplate of the return grille will be 1 3/4" larger than the duct measurement. Example: If the hole in your wall measures 12" wide and 6" tall, you will need to order the 12 x 6 grille. The faceplate of the grille will then be 13 3/4" wide by 7 3/4" tall. - Determine if you'd like your grille to come with pre-drilled screw holes. Hint: If you need to match up with pre-existing screw holes you'll want to drill your own. - Select your choice in the second drop down meny titled "Screw Holes". 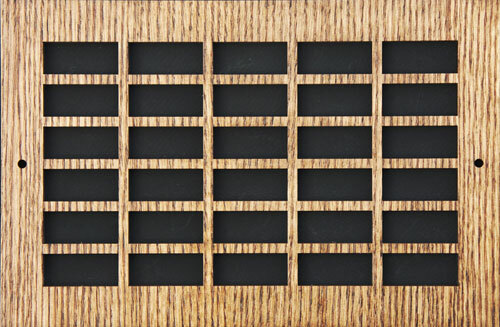 - Determine which wood veneer you'd like your decorative wood return grille to have. Hint: The manufacturer recommends choosing Maple if you plan to paint your grille. Reminder: The wood you select only refers to the face of the grille. The core will always be Birch. - Select your choice in the final drop down menu titled "Wood Type".